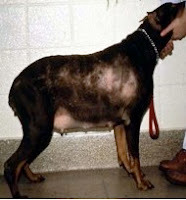 This patient is a 9-year-old, F/S, mixed-breed dog that I recently diagnosed with hypothyroidism based on clinical signs of obesity, lethargy, and seborrhea. Results of a CBC and serum chemistry panel were relatively normal, except for mild hypercholesterolemia. I'm confused? What does this mean? Does she have hyper- or hypothyroidism? Why is the serum concentrations of both T4 and T3 high with a low free T4? The positive thyroglobulin autoantibody titer is diagnostic for lymphocytic thyroiditis. The presence of T4 and T3 autoantibodies in this dog is also consistent with thyroiditis. The presence of clinical sign, taken together with the low serum free T4 value and high serum cTSH concentration, is consistent with primary hypothyroidism. It's likely that both the total T4 and T3 values are falsely high due to interference of the autoantibodies in the assays. I'd recommend starting this dog on thyroid hormone replacement and evaluating the clinical response. Thanks for your advice. The dog weighs 50 kg, so I started her on levo-thyroxine at a dose of 0.8 mg BID. Since her total T4 was high even before starting thyroid supplementation, what should I do now? The dog is showing clinical improvement and not acting hyperthyroid. Should I just decrease her dose a bit, or cut it in half? The dog definitely has T4 and T3 autoantibodies. In these dogs, you can not use post-pill total T4 values to monitor thyroid hormone supplementation because the reported numbers are meaningless (the autoantibodies interfere with the T4 and T3 determinations). The only thyroid tests that can be accurately monitored in a dog with T4 and T3 autoantibodies is cTSH and free T4 by ED. The fact that the dog's serum TSH value has fallen so dramatically from 0.92 to 0.03 ng/ml suggests that the replacement dose is at least adequate and may be more than enough. You certainly could monitor his free T4 values, but the ideal post-pill time for free T4 monitoring has not been determined. normalized after treatment? If the dose is adequate, the hypercholesterolemia should resolve. If the dog is being overdosed with L-T4, signs of hyperthyroidism will develop. These may include tachycardia, excitability, excessive weight loss, and polyuria. You current dose is quite high, so I would decrease the dose. Cutting in half may be fine, but I'd probably go down to 0.5-0.6 BID for now and then reevaluate in a month. If I understand you correctly, I should only monitor clinical signs and not depend on thyroid blood work for dose adjustments for this dog? Yes, you are going to have to be a clinician and use your history and physical examinations to monitor this dog. I'd recommend that you do routine blood work (complete blood count, serum chemistry panel, and complete urinalysis) at least once a year. At 9-years of age, you would do that even if he wasn't on the thyroid medication.